STATIC-X is back! Featuring the band's original lineup introduced on their 1999 platinum-selling debut full-length album, Wisconsin Death Trip, bassist Tony Campos, guitarist Koichi Fukuda and drummer Ken Jay have joined forces once again to release a new album, Project Regeneration. The album, set for release in spring 2019, will be released in conjunction with a world tour to commemorate the 20th anniversary of Wisconsin Death Trip. The band plans to perform the majority of their debut album at each show. Headline dates will serve as memorial events to honor late frontman Wayne Static, who passed away on November 1, 2014. More information on the world tour and other dates will be coming soon. The band has cultivated a treasure chest of vocal performances and musical compositions left behind by Wayne. 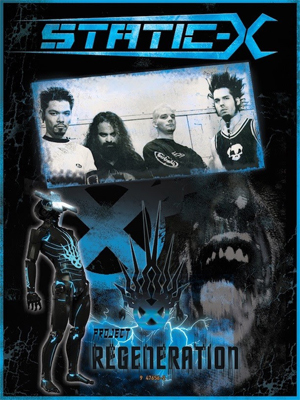 Along with the help of STATIC-X's long-time producer Ulrich Wild, the band is in the process of completing their seventh studio album, which will feature between 12 and 15 brand new STATIC-X tracks. "With the 20th anniversary of Wisconsin Death Trip quickly approaching, it feels like the right time to pay our respects to the band, to Wayne, and to all the fans who have been with us right from the start." says bassist Tony Campos. "We had a lot of material to work with... several demos that Wayne left behind, as well as some really great isolated vocal performances from some nearly finished songs. Together, we have been writing and crafting something very special!" Check out a new teaser featuring clips from a brand new music video, as well as five new STATIC-X tracks - "Road To Hell", "Something Of My Own", "Terminator Oscillator", "Hollow" and "Disco Otsego" - along with a personal message from bassist Tony Campos about the inspiration behind Project Regeneration below. "This is a celebration of STATIC-X, Wisconsin Death Trip, Wayne Static, and all of our fans," adds Campos. "We are very excited about what we have created, so we wanted to involve the fans early, and in a campaign sort of way, so that they can participate with us and help to dictate some of the things that we do." "We feel very grateful that we have such a loyal fan base that misses the band, and misses Wayne, and I know that Wayne would appreciate all the heart and effort that we are putting into this," says Tony Campos. "I've had some very heartfelt discussions with Wayne's family about doing this. They were very touched by the amount of love and effort that we have put into this new album and they have given us their full support. Having the blessing of Wayne's family means the world to us! I know in my heart that Wayne would be very proud!"